Welcome to Music Together Vivo! We are proud to offer high quality, research based music classes for infants, toddlers and preschoolers in communities across Northern Virginia. Director and teacher Cheryl Anderson Sabo (pictured right) started teaching Music Together® classes in the fall of 2001 after training with Dr. Lili Levinowitz of the Center for Music and Young Children. Cheryl trained to be a flutist in college and graduate school, enjoyed performing with Tales & Scales for several years, and found her joy working with young children and adults cultivating communities of connected music-makers. 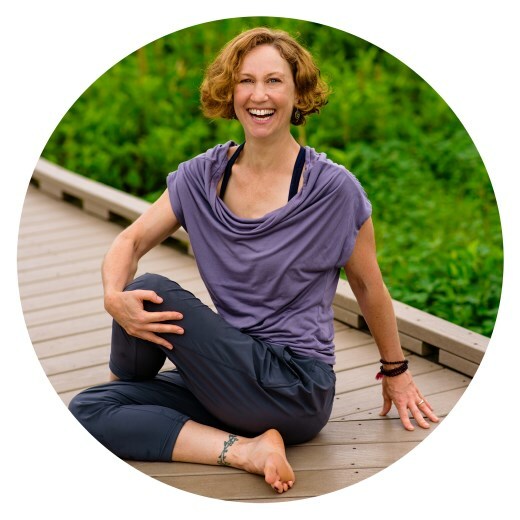 In addition to early childhood music, Cheryl also teaches Kripalu Yoga and YogaDance to adults. Read more about Cheryl below. Our Music Together Vivo mission is to weave fun, developmentally appropriate music & movement activities into a unique, uplifting music making experience. By communicating and expressing our human-ness with each other through music, we become a joyful music making community. Music Together Vivo offers classes throughout the week in Alexandria, Bethesda, Gainesville and the Burke/Springfield area, serving children and families from across Northern Virginia. Come join us for a free trial of our children's music classes to find out if our program is right for you and your family! To learn more about the classes we offer, please visit our Classes page. More questions? Feel free to Contact Us at any time. A note from Cheryl: My first memory from childhood is skipping and jumping happily across a huge room. I must have been 3 or so, and though the details of the class are fuzzy, the memory of the feeling - pure joy while moving freely to music - is crystal clear. I have not always been so connected to my physical self. Sadly, as a teenager I became critical and worried about what everyone else thought of me. It was my great good fortune in college to have a dance teacher who created a safe environment where we could move and experience the joy of being connected to our physical selves just as we were, without constant striving to be 'more of this' and 'less of that.' I fell in love - again - with dance! I discovered Kripalu Yoga shortly after my first son was born. From the very first class I attended with Sandy of Joyful Heart Yoga, I knew I had found 'my yoga.' Sandy's way of gently leading us away from the stress of our daily lives and deep into our inner experience felt organic and whole, and I craved more of it. The feeling of being at home in my own skin, of body being happily tired and mind joyful yet calm, was familiar and wonderful. After over 10 years of being a student in Sandy's classes, I am honored to be taking over for her as she relocates to Houston. I completed my yoga teacher training this June at the Kripalu Center for Yoga and Health. I completed my YogaDance teacher training in 2011 with Mega, also Kripalu. I'm so pleased to be adding healthy, creative classes for adults to my happy Music Together teaching life, and I hope you'll come along with me. Cheryl Anderson Sabo holds a Master of Music degree from Arizona State University, is a certified Kripalu Yoga teacher, registered Let Your Yoga Dance teacher, licensed Music Together director, and completed the highest level of certification - Certification Level II - with the Center for Music and Young Children in Princeton, NJ.